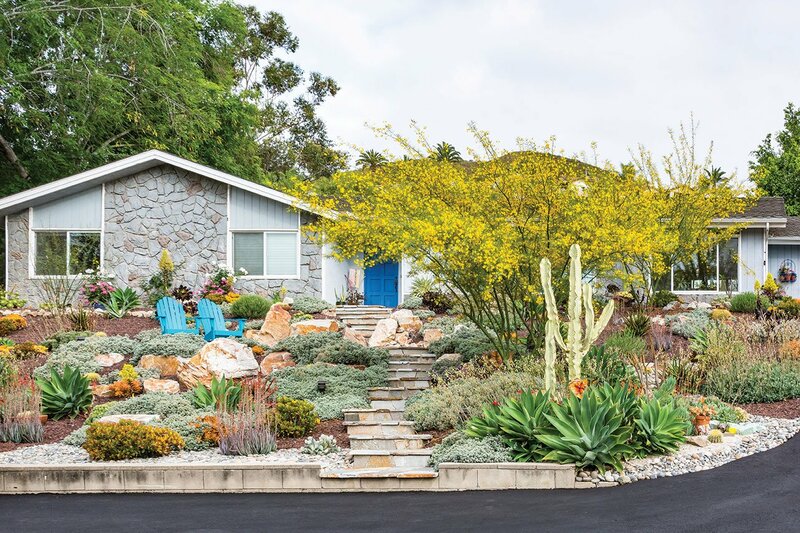 From their hilltop ranch home, the Starks enjoy vistas across their front yard and Eucalyptus Hills to distant mountains. The spring-flowering palo verde trees are now favorites of the couple. Before she retired, elementary school teacher Rosemary Stark split her time equally between work and family. “There weren’t hours in the day for anything else,” she says as she and her husband, commercial construction executive Patrick Stark, raised their two children in a ranch home perched high on 2 acres in Eucalyptus Hills. 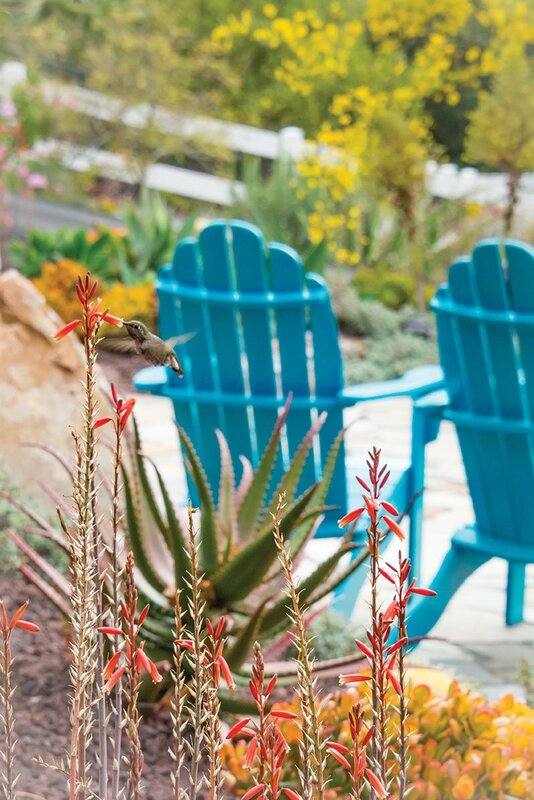 A colorful succulent garden designed by Laura Eubanks of Design for Serenity fills the front yard. After the couple became empty nesters and left the work-a-day world, “the floodgates opened to all the possibilities,” Rosemary says, with a wide smile. Travel in their motor home, volunteer work, golf for Patrick and yoga for Rosemary—all soon crowded their calendars. So did newly discovered gifts for art, created in his and her home workshops. A hummingbird sips from spring flowers. 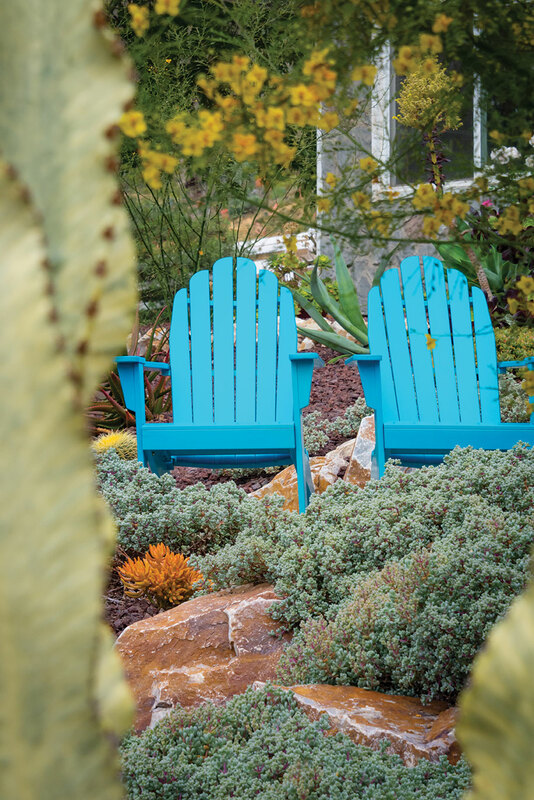 In the past decade, the duo also poured time and talent into major home landscape projects, often doing most of the heavy lifting themselves. 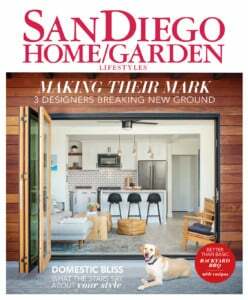 Among their accomplishments are a custom entry gate to welcome visitors up their long driveway, a cobble-edged labyrinth Rosemary strolls daily and a colorful succulent tapestry garden outside the front door. Behind the house, a new spa and cozy built-in seating nestle in a broad slope, now a vibrant outdoor gallery. Here the couple’s art—Patrick’s metal sculptures, Rosemary’s fused glass and mixed-media pieces they create together—glint in the sunlight. Often pieces are tucked next to intriguing specimen minerals the two rock hounds collect on road trips. Also in the mix are glass vessels by Rosemary’s friends in the Art Glass Association of Southern California and Patrick’s delicately balanced cairns (stacked stones). 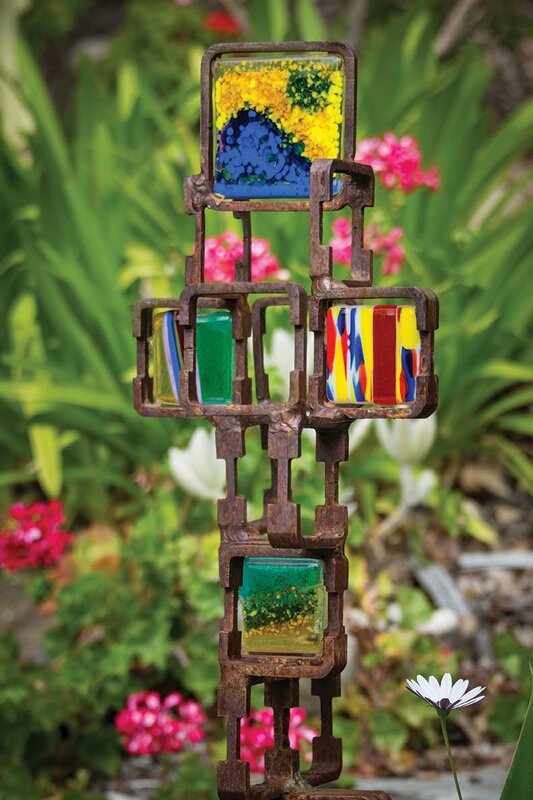 Fused glass tiles made by Rosemary are mounted in a welded steel sculpture by Patrick. 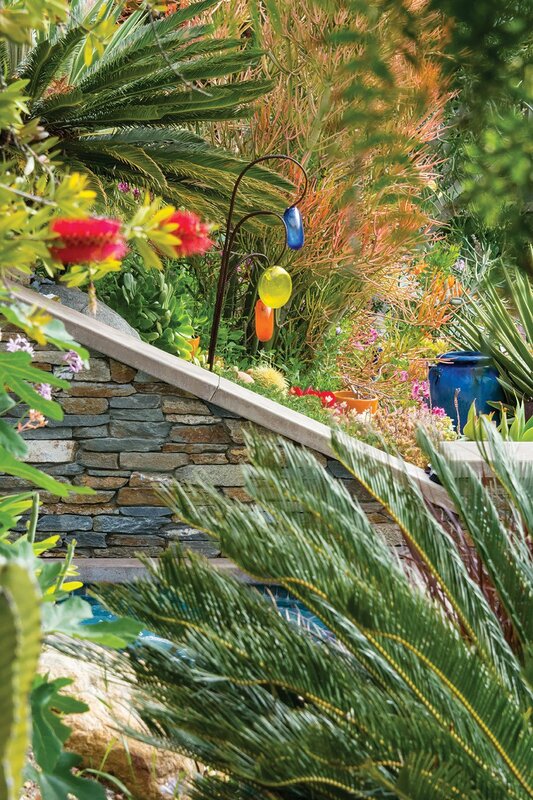 Patrick designed the backyard’s walled enclosure, home to a fire feature, waterfall and spa. The couple picked the stack stone and flagstone colors to reflect the natural landscape. Patrick turned a trio of glass globes given to Rosemary by a friend into a colorful sculpture in the backyard. Over the years, Rosemary struggled to find plants for the slope unfazed by searing summers, water cutbacks and munching critters. “I had lots of failures,” she admits as survivors like succulents, lantana, rosemary, geraniums and other water-wise “toughies” eventually emerged. Her fused glass “stakes” in fiery oranges and reds, gazing balls and glazed containers “mulched” with glass beads fill in for floral color in the foliage-rich landscape. 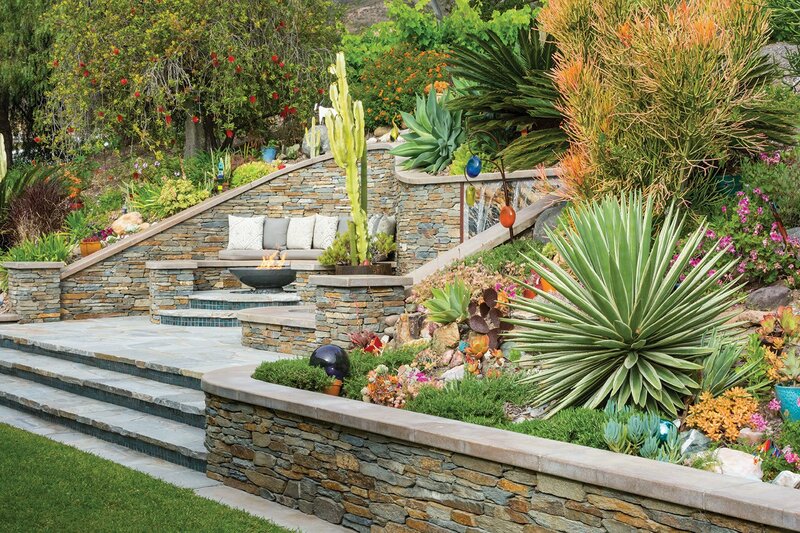 Lava rock mulch, ribbons of river rock and more boulders showcase foxtail agave rosettes, copper-red Aloe ‘Cynthia Giddy’ and A. cameronii, long-legged ‘Plum Petal’ aeoniums, ‘Sunset’ and silver jade plants and mounds of brilliant pink-flowered ice plant (Oscularia deltoides). Two airy palo verdes add green limbs, lacy foliage and profuse yellow flowers. “Beautiful—they’re now our favorite trees,” Rosemary says. 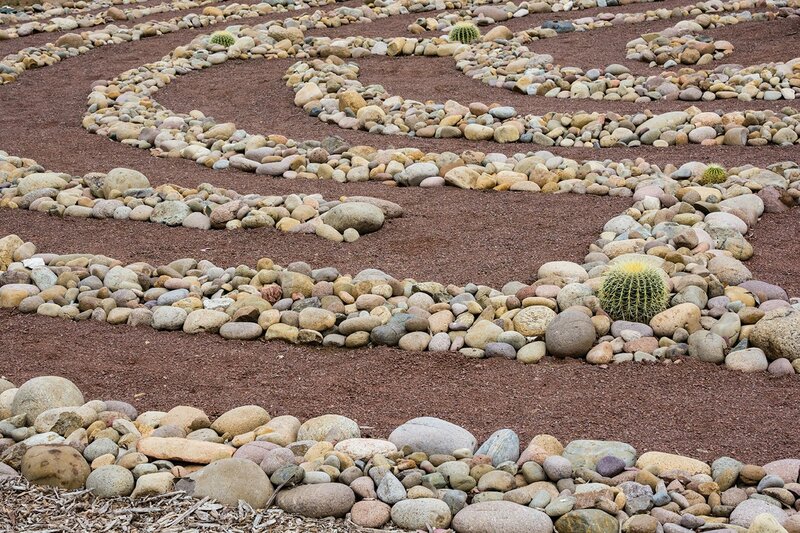 Rosemary walks the labyrinth’s decomposed granite paths daily. During the holidays, the couple joins their two children and families on a group walk there to share New Year’s wishes. 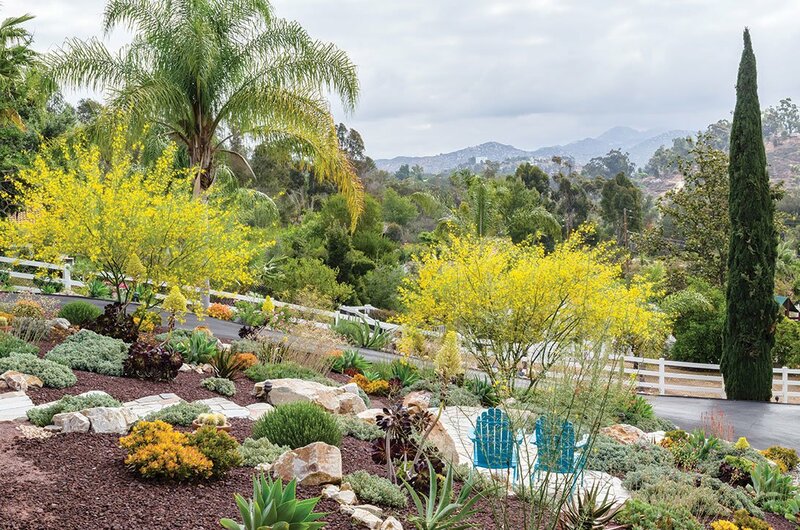 Not long after this makeover, an abundant rainy season sent raging runoff down a far edge of the property, digging a deep gulley and unearthing thousands of cobbles. “I thought, ‘What good can come of this? Well, maybe I can build my labyrinth,’” remembers Rosemary, who had pinned a picture of one on her studio bulletin board years earlier. 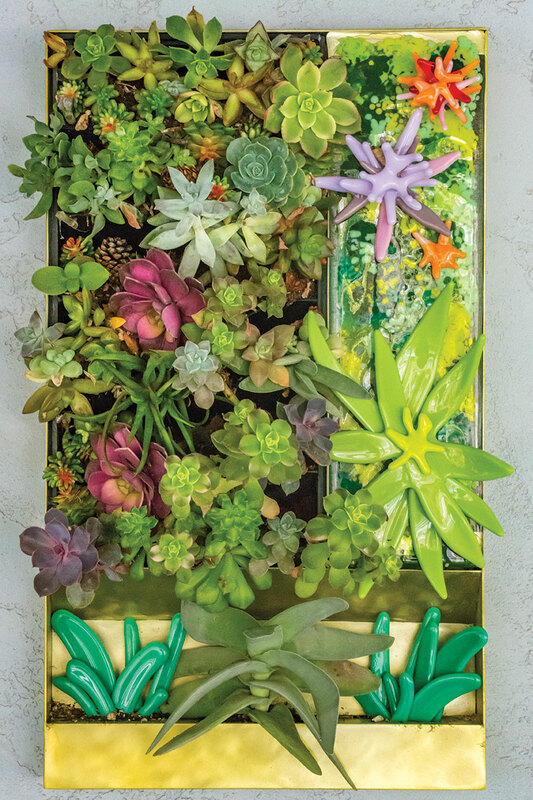 Live succulents mix with Rosemary’s glass flora in this vertical garden featured in the Art Glass Association’s annual show in Balboa Park. Annually, the garden now hosts festive family celebrations, including a Thanksgiving feast in the backyard and a Christmas gathering to walk the labyrinth and make New Year wishes. Future plans include a meditative “secret garden” near the labyrinth and a one-of-a-kind playhouse for the couple’s first grandchild, born last fall.